Don’t you love to see how other people entertain? When the newest edition to our chef team, the darling Sarah Simms of La Femme Epicure, told me she was hosting a tapas party with her friend from Smitten on Paper, I had the voyeuristic urge to be a fly on the wall for the evening. 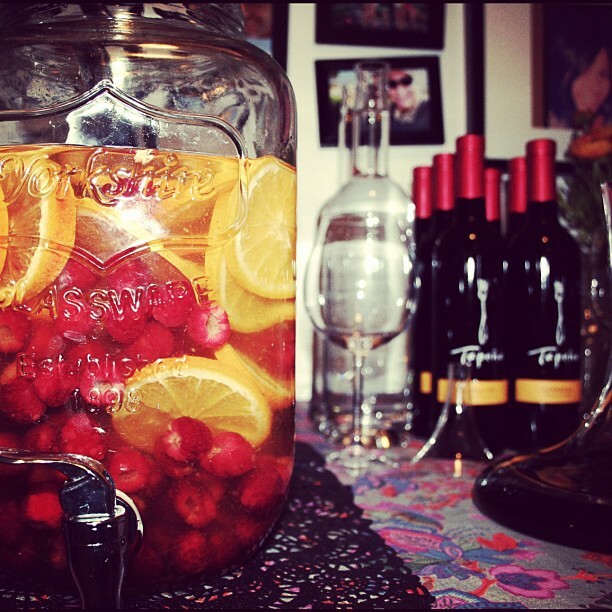 White Wine Sangria with local fruit! 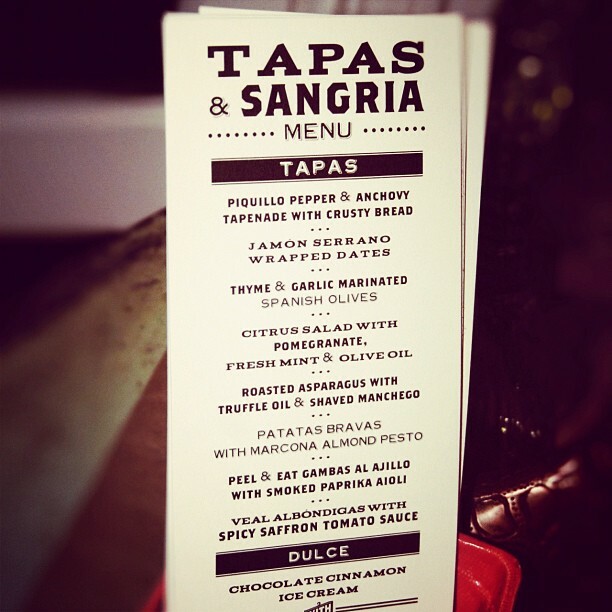 A selection of 8 homemade tapas + dessert! Stylish paper goods in cool fonts! Oh my. Well my wish has come true, all the pictures from what must have been a magical evening are up here! Don’t miss Sarah’s expert advice for how to plan a tres chic dinner party of any size or theme on your own. All photos taken by RW Simms & Paige Johnson. 1. Make dessert something to look forward to. I’m a sucker for a good dessert, but I’ll pass it up if it’s not worth the indulgence. 2. Make an organized to-do-list. A step-by-step shopping and prep list will give you a better sense of what you have to do (and how much you can prep beforehand!). 3. Make your expectations clear. As a partygoer I’m always happy to bring something, but I hate the idea of bringing something totally superfluous or something the host already has. 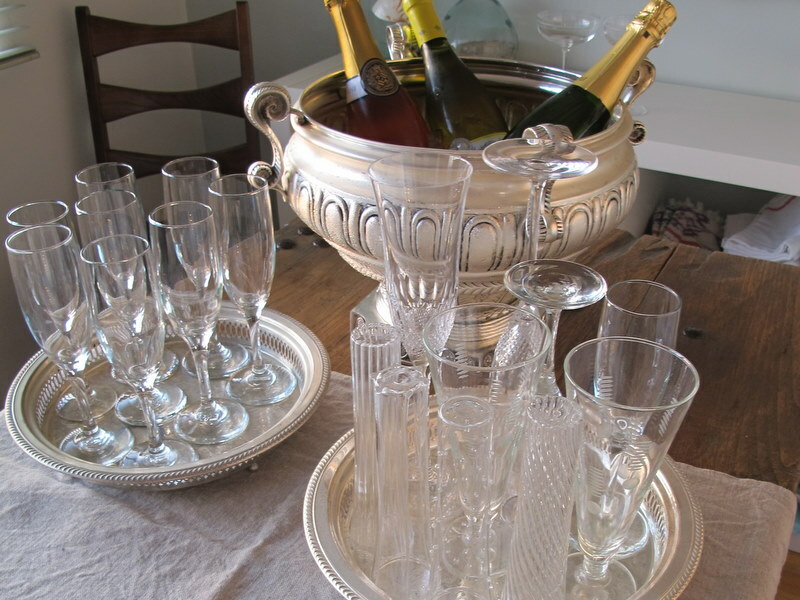 If you’re throwing a party and guests ask/offer to bring something, point them in the right direction. 4. Let your iPod rip. Create a playlist beforehand worthy of the atmosphere you want to create. That way you can hit play as you finish getting ready and not worry about that recording of you playing Dorothy in high school spoiling the mood. 5. Enjoy yourself! No one’s judging you on the fold of your napkins or if the wine is served a degree or two in the wrong direction. If you’re having fun, your guests will, too. 2. Be aware of your jewels and accessory selections. Although turquoise stones are pretty to look at, no one wants them in their ceviche. Save the prizes for the piñatas. I discourage long scarves, necklaces, shoulder duster earrings and the like. 3. Do not invite more than one man you’re dating. Although you will be tempted, don’t do it. 4. Have a start time and an end time. Then people will (hopefully) attempt to show up at a reasonable hour (Angelenos… I’m talking to you!). 5. People are there to see you and be social, do not spend all night in the kitchen, go mingle! All of us A & O Girls (did you know Sarah and I work with 3 other amazing chefs?) are OBSESSED with the new Bon Appetit magazine. Under Adam Rapoport’s direction the food magazine feels fresh, modern and super useful. I end up dog earring almost every page to save in my “idea” file and we try recipes from the mag all the time at work. 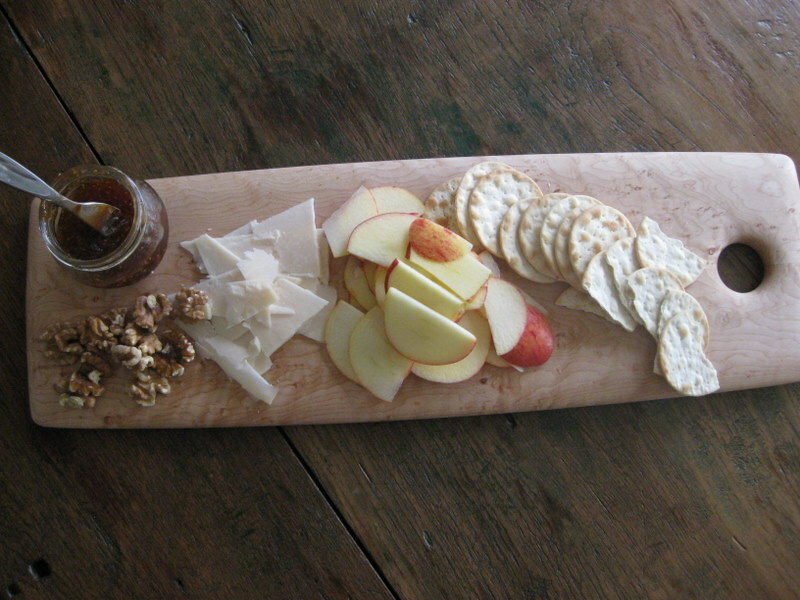 Anywho I was inspired by a column in this month’s issue from The Foodist: Top 5 (highly debatable) Entertaining Rules. 1. Always serve coconut cake and Papy Van Winkle Bourbon for dessert. 2. Recruit at least one friend to help with the dishes. 3. Invite a fun mix of interesting guests. 4. Tidy up your house but don’t go crazy cleaning it from top to bottom. 5. Serve dishes that accommodate your guests dietary restrictions and your own cooking prowess. I really like this list but I’m lucky enough to have friends who always help with the dishes unasked (thank you TL/MS/KB/AJ/EO) and I never worry about my guests mingling well together as I only ever invite good pals. So my list is a little different. 1. Serve at least one store bought course (dessert or appetizers usually). 2. Start the night with a signature drink, people hate making decisions/this makes you look fancy. 3. Always buy one more bottle of wine than you think you need (never fails to get opened). 4. Force guests to play Trivial Pursuit after dinner. 5. Use the dinner party as an excuse to get your husband to tidy up living room and clean the bathroom while you do the fun stuff like setting the table. What are yours? Maybe the other A & O ladies will share theirs soon? Here is our real dinner party advice. 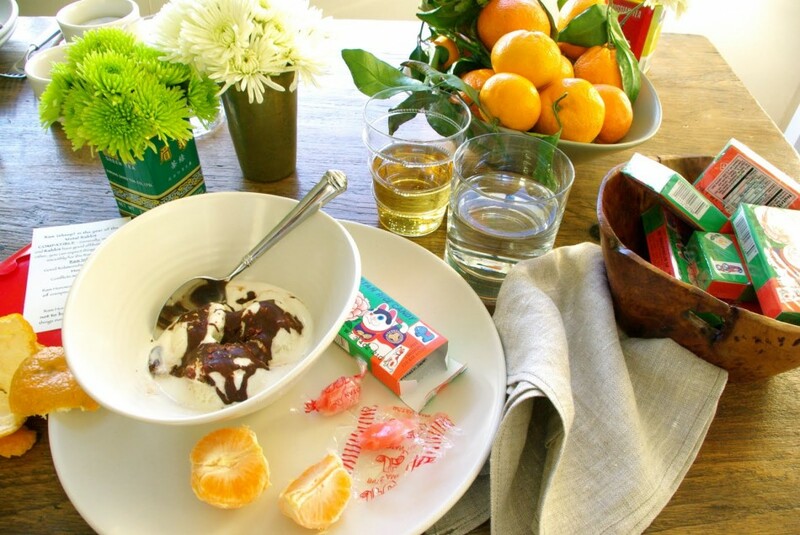 We’re excited to announce that our second feature is live on The Daily Meal. 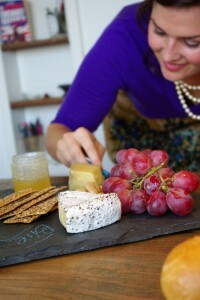 For this feature we updated Lydia’s Dinner Party Advice into our all-time top 5 dinner party tips. Guaranteed to make entertaining more fun! Tell us, any you’d add? As private chefs we spend our working hours planning, prepping and executing meals and parties for clients, but at the end of the day we’re still excited invite friends over for an impromptu dinner party. Here’s our top 5 tips for simple but fabulous entertaining, some of it gleaned from the great Ina Garten of Barefoot Contessa fame. 1. Only make 2 dishes for your dinner party but make them really good. A prefect roast chicken served alongside a fresh green salad with homemade croutons will wow your guests yet is managable for a week night dinner party. Trust us, cooking is fun but also tiring and you have to shop, get the house ready and plan your outfit, so go easy on yourself and just cook 2 really delicious items. 2. The other dishes you serve should be entirely store-bought, like a berry pie from a local bakery, or something you just assemble together, like a simple anti pasta platter or lovely cheese plate.The store is full of delicious and simple appetizer and dessert items. Make sure you take advantage. 3. NEVER make a dish that requires lots of last minute work. You won’t be able to hang out with your guests if you are stirring risotto during cocktail hour! 4. Dress up your house! Set your table before your guests arrive, place fresh flowers and candles around your entertaining areas like your living room or den and make sure you have some music playing softly in the background. When guests walk into even the smallest apartment that has a pretty set table, music playing and fresh flowers in a vase it sets the mood for a fun evening. Simple white votives flickering in juice glasses and one bouquet of brightly colored blooms from the grocery store placed in bud vases around a room can make all the difference. 5. Always offer a signature drink. This can be your “wow” factor. A signature drink can be as simple as beer or liquor from the same region as your meal, e.g. Sapporo if you’re making Japanese, a bourbon and soda if you’re going Southern. What’s important is that it marks this night as different and sets the tone for the menu to come. Naturally, you offer it up cold in a pretty glass as soon as your guests arrive. We hinted at some exciting news yesterday…. 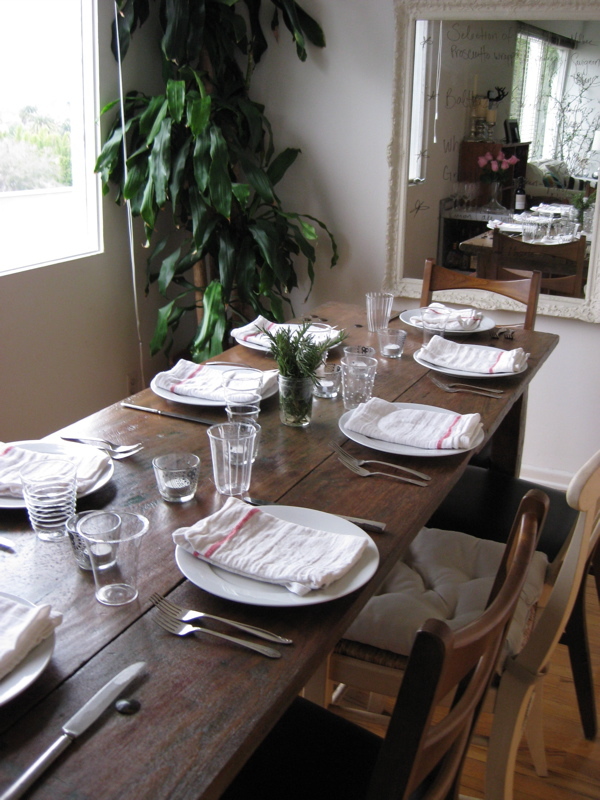 we are thrilled to share with you that we are offering a new service, A & O Dinner Party Blueprints. Now you can entertain the Apples & Onions way! 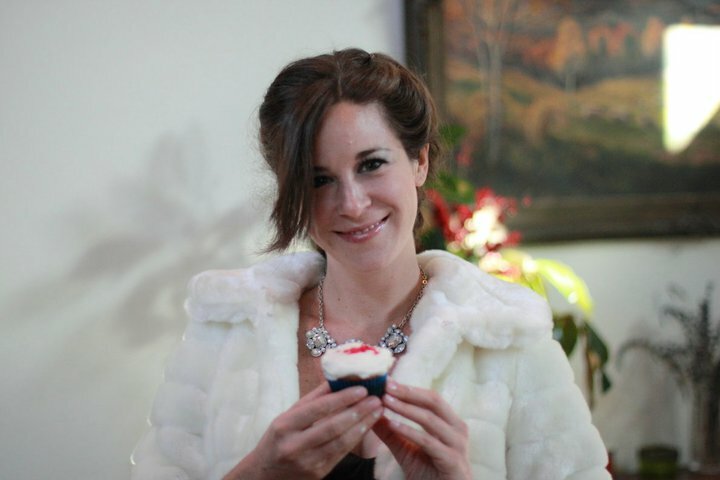 We’ve done weddings, Christmas parties, bridal showers, baby showers, Fourth of July Barbecues and fundraisers for 200+. But what we love most is a dinner party among friends, the pause in a busy week to share delicious food and even more delicious conversation. A moment to feel pretty and witty by candlelight. To feed and be fed, love and be loved, even on a week night. If only you had time to plan the perfect menu, research great recipes, come up with chic decor and the perfect signature cocktail to set the tone of your fabulous dinner party. We’re available to do all that for you! Tell us who you’re having and why plus any dietary restrictions or food allergies and then share an inspiration with us–a favorite dish, photo, movie, book, memory—whatever you have in mind for your ideal soiree. We’ll blueprint the party ASAP and it’ll be yours to throw. 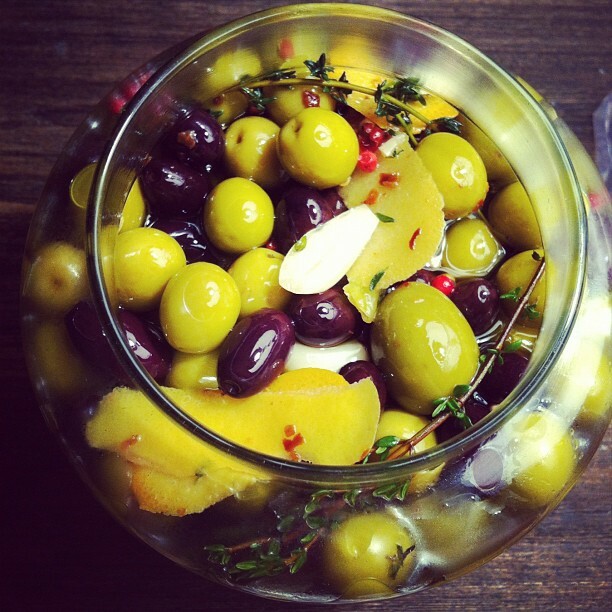 To start planning your next party email us at applesandonions@gmail.com! You guys! I can’t believe how jealous I am of Gwyneth Paltrow today. Not because she is married to a rock star, is tall and blond and stunning, is best friends with fashion royalty and Tracey Anderson, has a widely read and informative blog and even not because she has her pick of any good movie role in Hollywood. 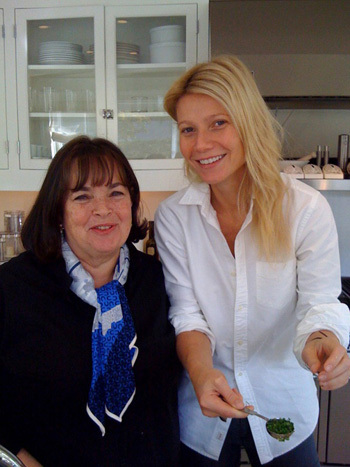 I am jealous because she got to go over to Ina Garten’s house and cook with her!!!!!! Yes, Ina Garten better known as the Barefoot Contessa! All the details and recipes of the homemade ricotta with fresh herbs they made together over at GOOP. They cooked and ate a recipe from Ina’s new book How Easy is That? which just dropped on Tuesday. I’m going to pick up a copy to devour on my honeymoon. Yes that is correct, I read cookbooks, all the way through. Sarah and I highly recommend thoroughly reading Ina’s cookbooks, she has TONS of valuable cooking and entertaining advice hidden on the chapter headings and recipe introductions. 1. Organize your grocery list by department of the grocery store. List all the dairy you need together, then all the produce together, all the dry goods, meats and so on. Then when shopping you glance down at your list and grab all the items in that one area of the store and move onto the next section. No racing back and forth, forgetting items and loosing your mind and motivation to cook. 2. Have all of your meal prepped and ready before your guests come so you can visit with them. No one feels comfortable to relax and have a good time when the hostess is in the stressing out in the kitchen, just getting started on dinner. Prep in advance so you can enjoy the evening too. 3. Only make a few dishes but make them really good. Make 3 dishes perfectly and but buy the rest from the store or have a friend bring a dish. 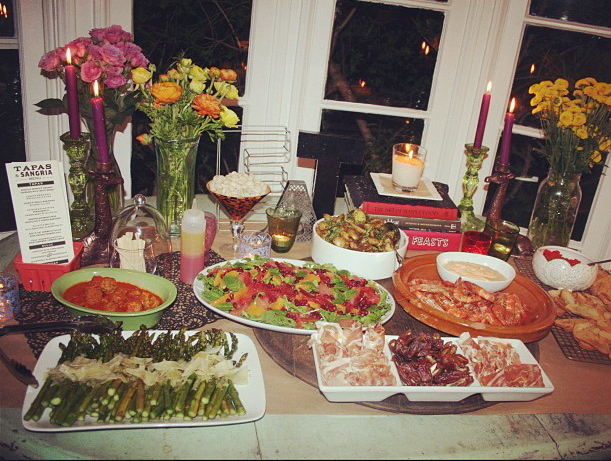 I often buy a spread of store bought appetizers, make 3 yummy dinner dishes and then have a guest bring dessert. This way you can enjoy the cooking process and put energy into making those cooked dishes spectacular instead of feeling overwhelmed by the 6 items you have to make in one afternoon. Ina’s cookbooks make fantastic gifts as the recipes are simple and the instructions are very thorough. Her recipes are so well tested that literally every single recipe is delicious and you can execute it perfectly the first time making the dish (though Ina’ advises not to make a new recipe for important occasions with out doing a trail run first.) I so look forward to the day when Sarah and I are lounging in her squashy arm chairs, draped in cashmere blankets and nibbling on gougeres and toasting Veuve Clicquot with Jeffery and Ina in the Hamptons. Yes, Gwyneth can come over too. Sigh. 1. Only serve 3 dishes for dinner and a dessert and only cook 2 of the dishes (i.e. a store bought dessert, or one dish a green salad.) Trust me, cooking is fun but tiring and you have to shop and get the house ready so don’t over do it. Just make 2 really yummy dishes and simplify the other dishes. 2. NEVER make a dish that requires lots of last minute work, you won’t be able to hang out with your guests if you are stirring risotto during cocktails! Thought this might be helpful to some of you out there!